My 2016 New Year’s resolution was to blog regularly here on LinkedIn. I was aiming for something between weekly and fortnightly postings. This is my 31st post of the year, so on average I hit that target. As this visualization shows, the pace slowed down as the year went on. My plan was to summarize the consensus predictions from various health IT blogs and periodicals, then track each prediction throughout the year. Generally, I kept to the plan with only a few diversions. The most popular topic (based on views) was the HIMSS16 conference. I wrote one article prior to the conference that discussed trends in the educational topic offerings and a second article after the conference based on an analysis of tweets tagged with #HIMSS16. I was hoping the pre-conference article would be a good prediction of the hot topics at HIMSS16, and the post-conference article would demonstrate what the hot topics actually were. 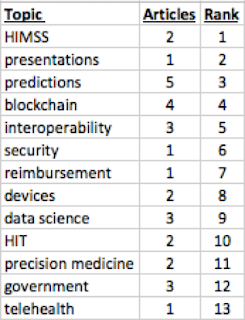 What I found instead with the pre-conference article is that HIMSS changed its educational session categories significantly between 2015 and 2016. And the post-conference analysis of tweets showed that vendors were imploring conference attendees to visit their booths. The exercise was fun but less informative than I expected. The number two article was a digression into the world of presentation skills. I put together an analysis of what makes John Oliver’s presentation techniques so effective. Most of this year’s blog posts enjoyed one or two weeks of readership immediately after publication; this was one of the few that experienced a second peak of readership, perhaps because someone discovered it and shared it months later. Articles about predictions held the number 3 spot on the chart, but this category was number 1 in terms of the number of articles posted because I updated the predictions throughout the year. I found it interesting that the articles concerning predictions in general were much more popular than articles about individual predictions. Blockchain was a surprise topic for me in 2016. In January, when I was researching predictions for the year, there was one line in a single blog post about Blockchain. (Congratulations to Chilmark for being ahead of the curve!) By mid-year, Blockchain was indisputably trending in health IT. Rounding out the top five most popular categories – and comprising half of the published articles – was interoperability, a perennial popular topic. In 2016 the industry came to a consensus that issues related to technology and standards for interoperability are largely solved, and the biggest reason why interoperability fails is because there’s no business motivation to share data – or often, there are business reasons not to share data. The culmination of this conversation was to penalize information blockers as part of the 21st Century Cures Act, which was passed in the final weeks of 2016. 2017’s interoperability conversation may be about making information sharing “on by default” instead of “off by default” as a way of taking it to the next level. Will I continue blogging in 2017? Yes, but with less frequency. I’ll forego the posts about individual predictions and focus on more general predictions and conferences like HIMSS. Check in next year!